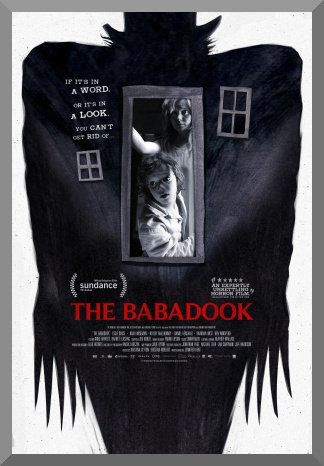 The first thing you must understand about Jennifer Kent’s The Babadook is how it can be viewed in one of two ways – for base thrills, you can look at it through the lens of a traditional horror film, and it can deliver. But if you care to put in a bit of effort, and peel back layers as you’re watching, another thing becomes clear to you – a pressing, surreal, violent, but ultimately wrenching depiction of coping with grief, trauma, and depression, a 94 minute parable on examining feelings of helplessness and losing control. This is what tips it from the grounds of passable to notable. If you’ve read anything about this film, then this isn’t a particularly new revelation, but it still stands to be mentioned, as does the movie’s wondrous and enveloping direction, excellent atmosphere, and tight performances. And yes, it’s quite scary. Essie Davis stars as Amelia, a nursing home employee and single mother raising an aggressive, paranoid, and hyper almost-seven-year-old son named Samuel (Noah Wiseman). Amelia’s husband Oskar died on the day their child was born, in a car crash while they were en route to the maternity ward. As a result, Samuel’s birthday is a complex and mellow time for Amelia, and the occasion is never celebrated on the date itself. After her son is taken out of school for brandishing a weapon he made himself, and this happens right around his birthday, it’s apparent that Amelia’s stress and Samuel’s antisocial behavior are running at dangerous levels. And it gets worse. Of course it does. In Samuel’s room, Amelia finds a strange pop-up book called Mister Babadook. The art is oblique and minimalist, and the content unraveling and vaguely threatening. The story cryptically warns of its mysterious titular creature, a persistent spirit who either befriends a person or kills them, “If it’s in a word or it’s in a look / You can’t get rid of the Babadook”. Amelia quickly decides not to continue reading the book to her son, and hides it away. But that doesn’t solve the problem. Samuel’s pre-existing fear of monsters is exacerbated as he constantly warns that The Babadook is after them, and while his mother initially believes it to be his erratic nature worsening, she soon realizes that their old house is being occupied by something. Who knows what it is – but it’s growing stronger, and it’s taking advantage of the fragile mental state of Amelia, slowly driving her deeper and deeper into the far fringes of insanity, knowing that one day, she’ll just… lose it. Careening between quietly unsettling and demonic explosion, The Babadook succeeds in igniting a tense and relentless atmosphere. Jennifer Kent does an outstanding job at creating that engrossing mood, necessary for such a stylistically driven movie as this. Moments that wouldn’t be very scary on their own are driven to terrifying levels thanks to her work, and it is to her massive credit that unlike many horror directors, she manages this feat without gallons of gore, or even worse, excessive use of jump scares – Kent knows that quality, earned tension and suspense is built through careful work and deliberate aesthetic decisions, rather than clanging noises and dark, incomprehensible lighting. As for the talent in front of the camera, Essie Davis’ work as Amelia goes above and beyond what’s normally expected in terms of acting chops in horror flicks – partially because The Babadook is far more than your typical entry in the genre. While Davis’ portrayal of a woman thrown into the depths of madness is certainly frightening, it’s her delivery of the subtext of Kent’s screenplay – that of the externalization of all-consuming grief and guilt in Amelia’s loss of her husband and the inescapable task of raising a troublesome child by herself – that makes the performance all the more memorable. In his role as the rambunctious and somewhat deranged child, Noah Wiseman cuts through the swarm of mediocrity or cheesiness expected in most young child actors and delivers something chilling. Wiseman very much gives an extreme version of cinema’s archetypical “problem child”, and adds a natural evolution to the character throughout the progression of the plot. His onscreen dynamic with Davis is all the more impressive considering that out of concern for Wiseman’s well-being, he wasn’t even on set when the film’s most disturbing content was filmed. By the time The Babadook reaches its finale, it has moved from brooding character drama to screechingly overt horror, to the point where the film’s thematic subtlety, which worked so well in its first half, is left in the rearview mirror. If there was any main criticism to be leveled here, it’s that. However, it’s not enough to ruin the strong direction, stunning visuals, and genuinely solid acting that works in the movie’s favor. This is a polished and crafty creation. In the ’50s, they might have called it a “nifty little picture”. Everything is all the more remarkable when you consider the fact that it is Kent’s feature debut – that’s right, this is her first movie. And if she decides to continue in the horror genre, once she nails down a consistent tone and can find more multilevel stories to share, then we’ll probably all be sleeping with the lights on soon.